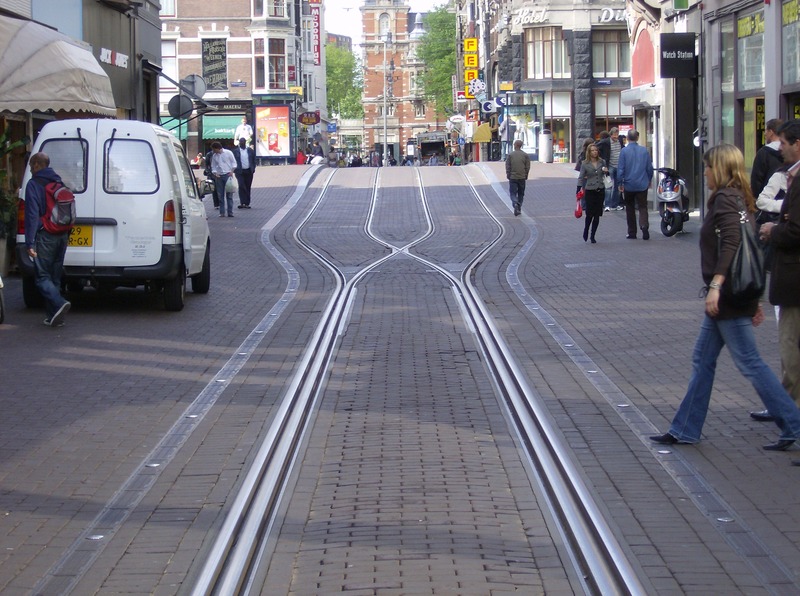 Amsterdam’s Leidsestraat shows how gauntlet track allows bidrectional light rail operation in a very narrow alignment, even with very close headways. Also remarkable is how smoothly, efficiently, peacefully, and safely the tram line blends in with, complements, and serves all the pedestrians who walk alongside, behind, and even in front of the trams. Photo: Roeland Koning . 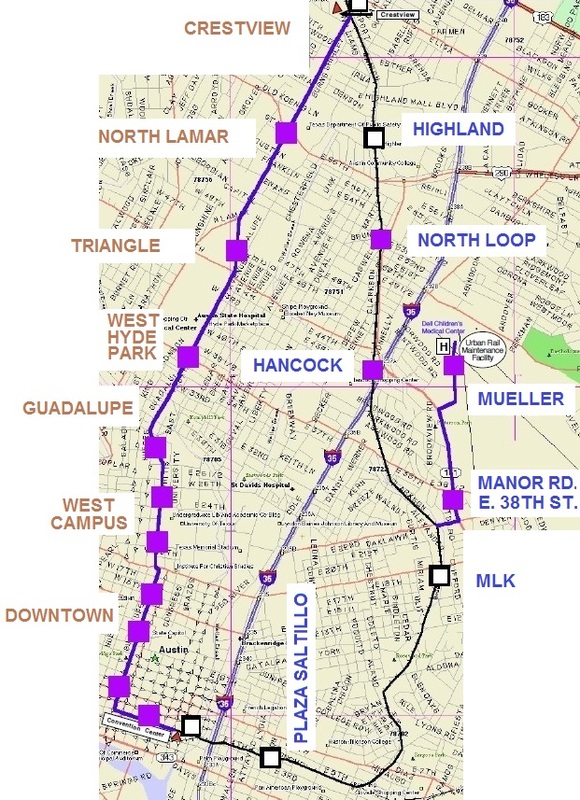 In the recent posting How urban rail can be installed in the Guadalupe-Lamar corridor (Oct. 10th), Lyndon Henry discussed how urban rail in the Guadalupe-Lamar (G-L) corridor could deal with right-of-way constraints. For especially confined, narrow stretches, Lyndon suggested that interlaced, or gauntlet, track was an option. Basically, gauntlet track works like a single-track section, but it doesn’t require movable switchpoints. Instead, it’s completely stationary, with one track in one direction overlapping, or interlacing, with the track in the opposite direction. Then, when the right-of-way becomes wider, the two tracks divide back into separate tracks in each direction again. 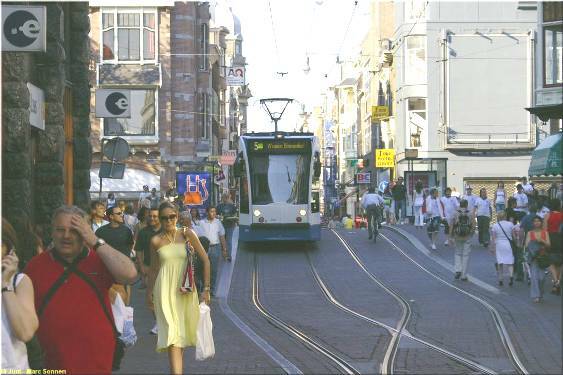 To expand on what Lyndon has explained about dealing with constrained rights-of-way (ROW) and the use of interlaced or gauntlet track, probably it’s helpful to focus on perhaps the most famous example — the Leidsestraat, a very narrow street in Amsterdam. 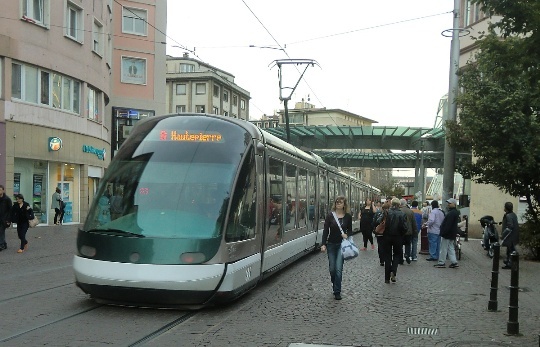 This is a city filled with trams (aka streetcars, light rail). 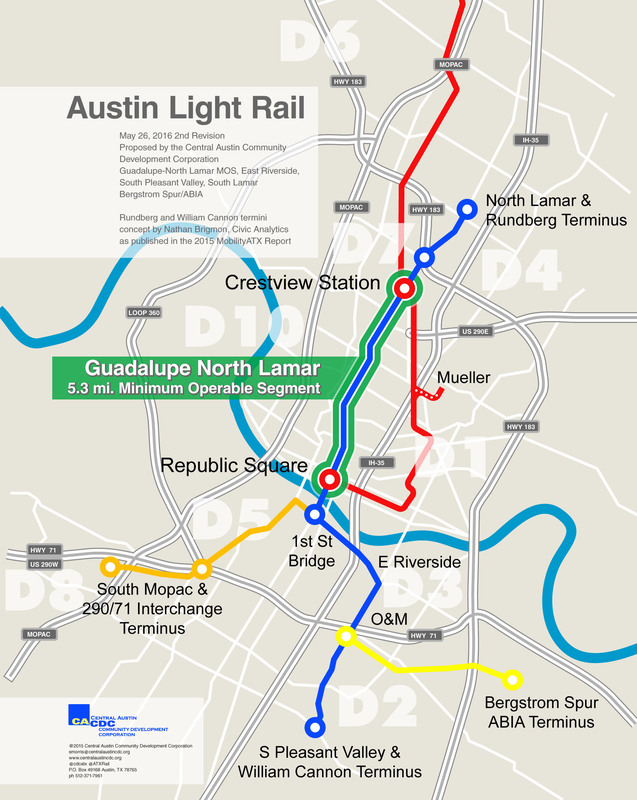 In Europe, the tramway is basically surface electric urban rail ­(light rail transit) that can adapt like a chameleon — it is what it is, wherever it is. Flexibility is its trademark and it’s designed to fit within a budget. The Leidsestraat is about a third of a mile long in the center of the city and is home to three GVB (transit agency) tram lines running bi-directionally two to three minutes apart (see map below). Trams run constantly back and forth, sharing the gauntlet (interlaced) sections one at a time, and passing one another where the tracks branch out into double-tracked sections, where the street appears to be less than 40 feet (12-13 meters) wide. 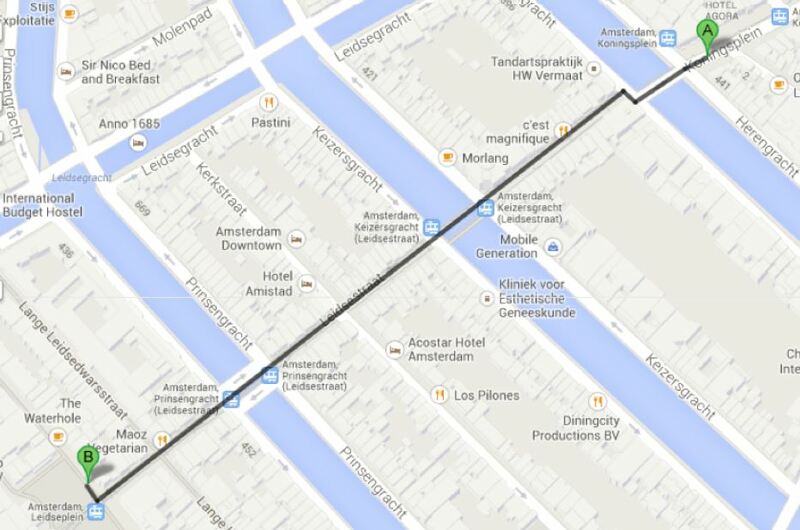 Leidsestraat alignment runs about 500 meters (0.31 mile) in length, passing over several canals. Map: Dave Dobbs (from Google Maps). 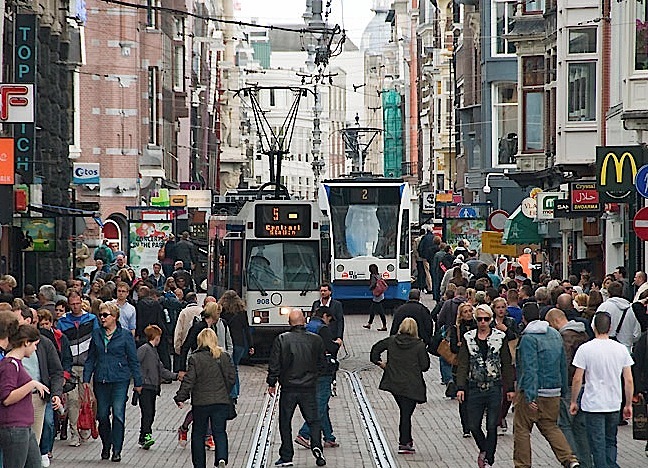 Light rail operation in the Leidsestraat is even more remarkable when you consider that it’s one of the busiest autofree streets in the world, teeming with pedestrians and bicyclists (as you can tell from the photos). Motor vehicles are allowed very limited access to serve retail stores, restaurants, and other businesses. 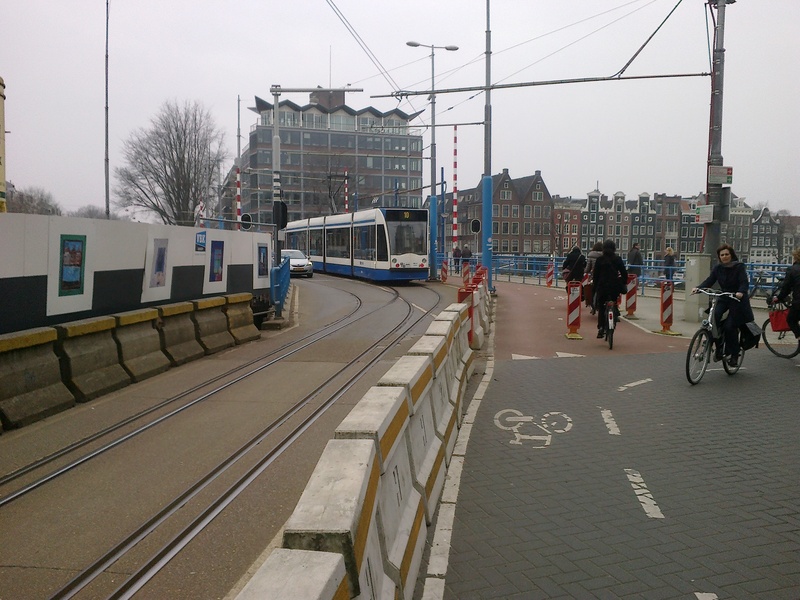 Besides how well gauntlet track works with relatively close headways, allowing light rail trains to access this extremely narrow urban street, is how smoothly, efficiently, peacefully, and safely it blends in with, complements, and serves all the pedestrians who walk alongside, behind, and even in front of the trams. 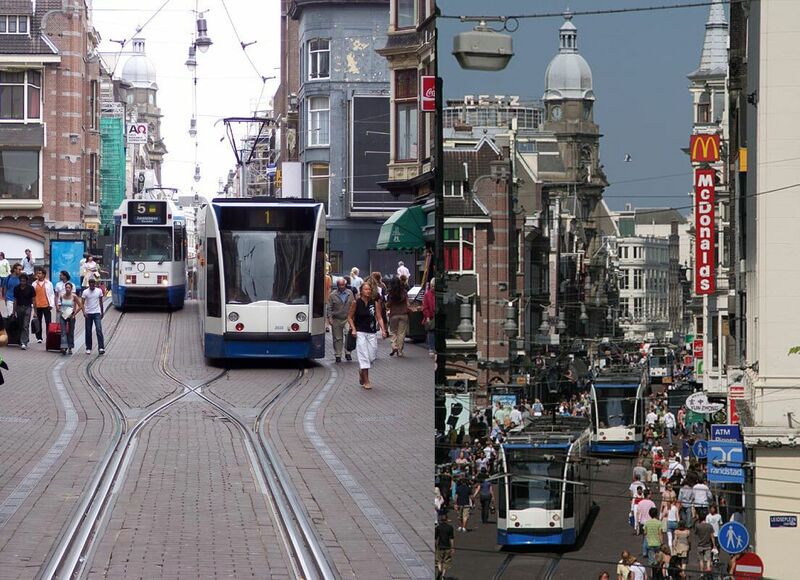 Here’s an excellent 2-minute video showing trams operating in both directions into and out of one of the interlaced sections through the Leidsestraat. 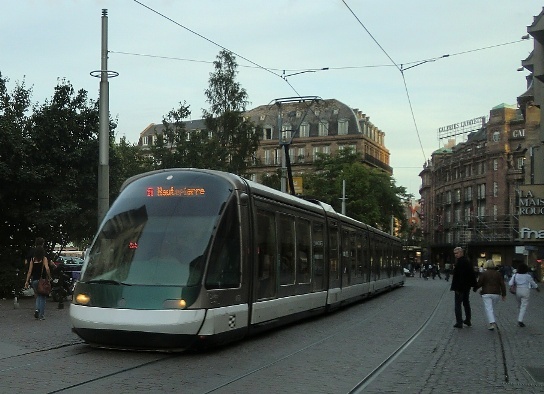 As evening approaches, a tram glides through Strasbourg’s Place Kléber as pedestrians stroll along the other track. Photo: Franz Roski. 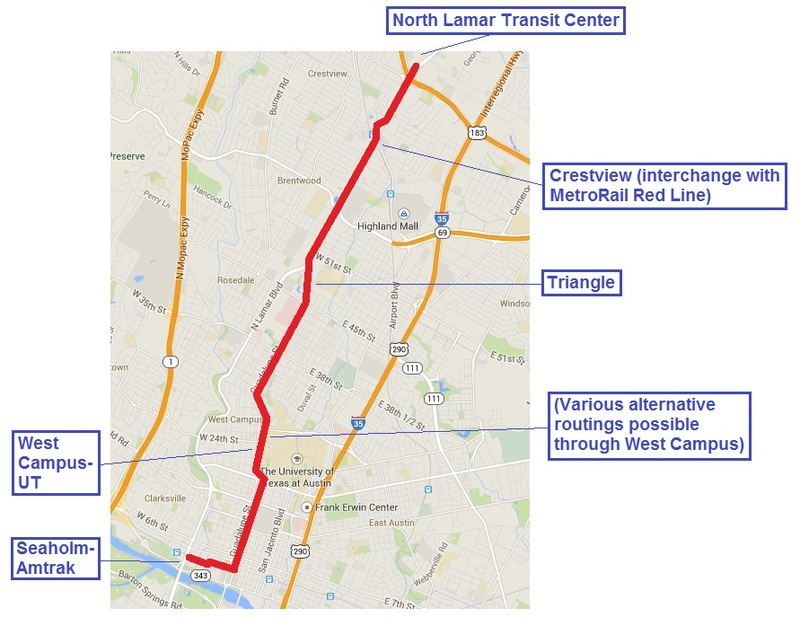 Since urban rail supporters been discussing possible alignment designs for the Guadalupe-Lamar (G-L) corridor, the need for transit-priority lanes, and other issues, it might be helpful and interesting to observe how Europeans address this issue — typically, by converting entire streets to transit-pedestrian malls. 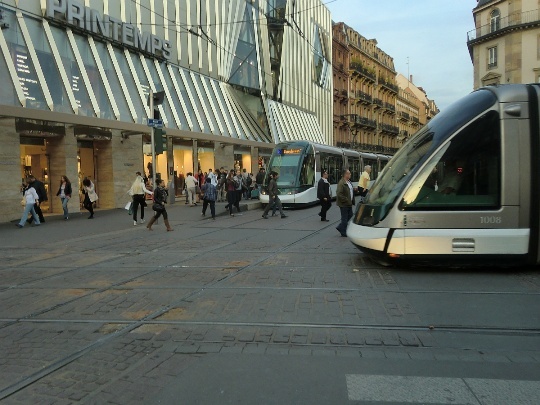 In this case, these recent photos (taken late in the day on 25 Sep. 2013 and posted to the online Eurotrams list by Franz A. Roski) show the transit-pedestrian mall in the French city of Strasbourg. An A-Line tram approaches Homme de Fer (Iron Man) station as pedestrians stroll alongside the open track. Photo: Franz Roski. 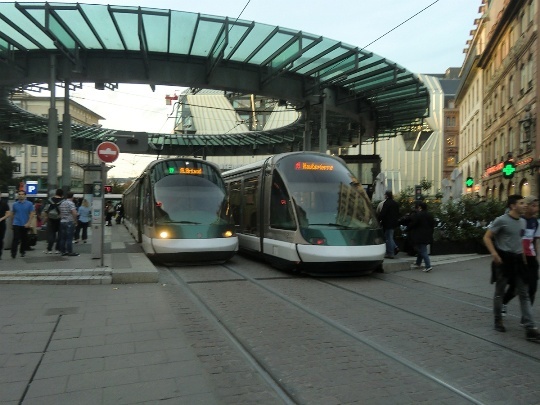 An A-Line tram arrives at Homme de Fer station as a D-Line tram for the opposite direction waits at the in the opposite platform. Photo: Franz Roski. Major crossing of different tram routes near Homme de Fer. Photo: Franz Roski. Another view of the tram line crossing near Homme de Fer — trams coming, going, and crossing! Photo: Franz Roski. • Notice the crowds — street capacity for motor vehicles is gone … but look at all the people that have come there, mostly by transit. Where would they park all their cars, anyway? 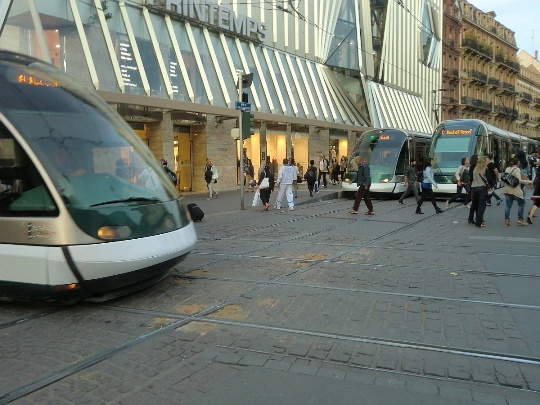 • Notice the safety issue — pedestrians comfortably, safely walking around, next to, in back of, even in front the light rail trams. You are currently browsing the archives for the Transit-pedestrian malls category.